Earlier, I introduced you to Henry Polkinhorn, a Washington, D.C. printer. From his building on D Street, Polkinhorn printed newspapers, books, and a plethora of other custom items. Of all the items he printed over the years, the most sought after item today is the playbill from Ford’s Theatre for April 14th, 1865. In this post we will explore the details of Polkinhorn’s work, in order to identify genuine playbills and later reprints. We will be utilizing the wonderful, but rare book, The Ford Theatre Lincoln Assassination Playbills: A Study by Walter C. Brenner. Mr. Brenner privately printed this 16 page book in 1937. In it he sorted out the many misconceptions about the playbills and, for the first time, created a tool for identifying and authenticating genuine playbills. In the foreword of his book, Mr. Brenner wisely stated that, when attempting to authenticate a playbill as genuine, “source and pedigree must be disregarded,” and many, “will not prefer to do so.” The simple truth is there is an exceedingly small possibility that genuine playbills still exist outside of libraries, museums, and private collections. In fact, many libraries, museums, and private collections themselves don’t even have genuine playbills. The best of provenance must be ignored when faced with the facts and details of the printed playbill. The evidence within is unbiased and is merely for the benefit and education of those interested in the drama at Ford’s. 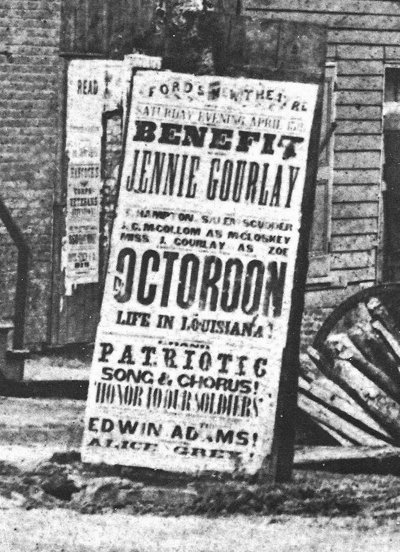 Large advertisement for Ford’s April 15th, 1865 performance of The Octoroon. The performance never occurred as the theatre was closed after Lincoln’s assassination. Now, just because a playbill says “H. Polkinhorn” at the bottom does not mean that it is genuine. Practically all the later forgeries and reprints include the correct printer. So, there are two issues of authentic playbills printed on April 14th, 1865, and one version later printed by Ford’s doorman. Buckingham only reprinted the first issue playbill and so the second issue, the one with “Honor to Our Soldiers”, has been saved from period forgeries. Aside from contemporaneously forged examples, all second issue playbills that exist are most likely genuine. 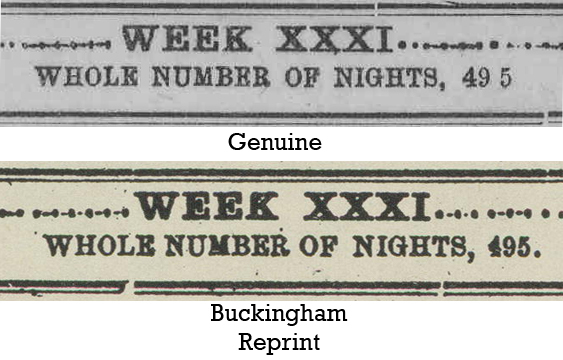 For the first issue playbills, however, careful attention must be paid to identify Buckingham and other reprints. As well as John Buckingham and Richard Polkinhorn did in recreating the first issue playbills, the devil is in the details. As we will see, Buckingham made his own mistakes and actually corrected mistakes that were present in the original bills, when making his copies. A close look at a genuine bill and a Buckingham copy shows the differences. The way we know that Buckingham used Polkinhorn’s own type and press is twofold. First, on the back of an 1891 Buckingham reprint there is a stamped note from R. O. Polkinhorn citing his involvement in creating the copies. Second, the type itself is a match for Polkinhorn’s press. One way to identify a bill that used Polkinhorn’s press is the particular type that is used to create the words “THE OCTOROON”. Other period reprints from other printers, like this one housed at the University of Delaware, did not have this specific font type. This clearly identifies it as being from another printer entirely. 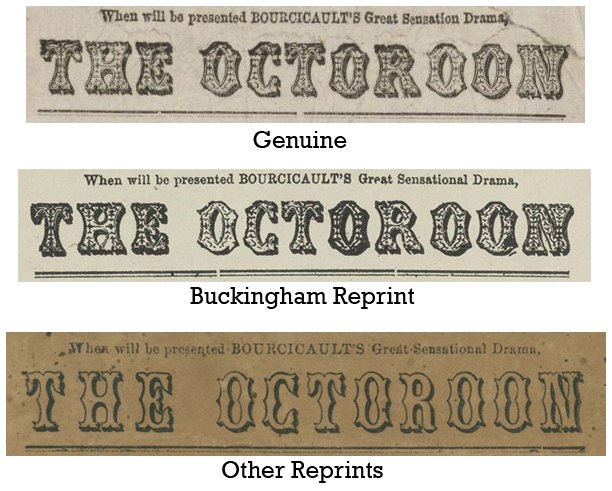 On the Buckingham reprints, however, “THE OCTOROON” is in the exact same type as on the original playbills, proving that Polkinhorn’s printing shop was used for the souvenirs. Not only is the “E” damaged, but also the final letters and numbers on many of the lines. According to Brenner this damage was caused by the gauge pins on the press getting in the way. However it happened, it provides the most notable difference between a real playbill and a souvenir. While the “E” was a mistake on the part of the printer, the pair also fixed mistakes from the original bill. In the genuine first issue bills, right above “The OCTOROON”, it states, “When will be presented BOURCICAULT’S Great Sensation Drama,”. This is a typo. It should read “Great Sensational Drama”. When Buckingham created his souvenirs he corrected it and changed it to the appropriate “Sensational” (See the Octoroon examples above). In addition, the original bill had an accidental space at the top. Under the heading it states, “WHOLE NUMBER OF NIGHTS 49 5”. There is a space between the 9 and 5 in “49 5”. Buckingham corrected this unnecessary space and changed it to “495”. In Walter Brenner’s book, he identifies 14 minute differences between Buckingham’s reprint and genuine playbills. From missing words to the vertical alignment of letters, he provides a chart of the changes. If a playbill has correctly passed the above criteria, this book should be consulted and the rest of the details authenticated. In addition to Buckingham’s souvenirs, many other printers and indiviudals of the period tried their hand at creating false bills. Any playbill that bears the announcement that, “THIS EVENING The Performance will be honored by the presence of PRESIDENT LINCOLN” is a fake. As was mentioned earlier, the playbills were altered when it was ascertained that Lincoln and his guests were attending the night’s performance, however, they were only changed to include lines from the song “Honor to Our Soldiers” and not to announce his attendance. Playbills containing Lincoln’s name are reprints from other printers, and not authentic. While period fakes are common, there are also modern fakes that often trip people up. Like Buckingham did so many years ago, museums sell reproduction playbills in their gift shops around the country. Ford’s Theatre actually sells a reproduction of the Buckingham reprint. It is attached to a reproduction wanted poster and costs $1.50. The paper is browned and made to look old, too. They are excellent reproductions but can add to the confusion when someone believes they have the genuine article. When it comes to Ford’s Theatre playbills from April 14th, 1865, it is important to dismiss any stories of provenance until the bill is authenticated. In Brenner’s book, he mentions a playbill with impeccable provenance. Two signed affidavits accompany it; one written by the owner of the bill and another by John T. Ford himself. In it he states, “I, John T. Ford on oath say that I presented Mr. A. K. Browne with a programme of the play of ‘Our American Cousin’ which I picked up near President Lincoln’s chair when he was assassinated…” This superb provenance is a rare and valued thing for historical artifacts. Unfortunately, the marred “E” on the playbill that accompanied these affidavits prove that it is not a genuine playbill, but instead a Buckingham reprint. The best provenance in the world has to be ignored when faced with unbiased evidence. Despite the affidavit to the contrary, John T. Ford was not even in D.C. when Lincoln was assassinated, and he did not arrive there until the Monday after the shooting. Treasure seekers had cleaned out the theatre box long before he showed up. As far as relics go, a genuine playbill is a treasured commodity. On its face, it’s an advertisement for a night at the theatre. In the context of history however, it exudes a sense of foreboding. These playbills capture Lincoln’s assassination in a way that no other artifact can. They are the last vestige of Lincoln as he lived, and the gateway to his immortality. While reproductions have been made, only genuine playbills provide the emotional impact of that moment frozen in time. They exist today as silent witnesses to Ford’s last great drama. The representation of the playbill shown on the University of Delaware site appears to be a Buckingham reprint (see, you’ve taught me something already). There is no mention of it being a reprint in the brief note accompanying the illustration. Are they aware that it is not an original? I wonder what the provenance is? Actually Rich, the University of Delaware playbill (which is the same one used on Wikipedia’s entry for Our American Cousin) is neither an original nor a Buckingham reprint. It’s another fake entirely. We know this because Buckingham used Polkinhorn’s press and type to make his reprints. The Delaware playbill doesn’t even come close to matching Polkinhorn’s work. The lettering on Laura Keene’s name is completely different and “The Octoroon” does not match Polkinhorn’s specific font. Look back in the post at the picture comparison of the Octoroon fonts and you’ll see. The Delaware copy is probably a reprint by “L. Brown”. These reprints include the mention of Lincoln coming to the theatre and are the most obvious fakes of them all. I went back in the post and added how “The Octoroon” looks in a genuine playbill, Buckingham’s reprint, and other reprints. 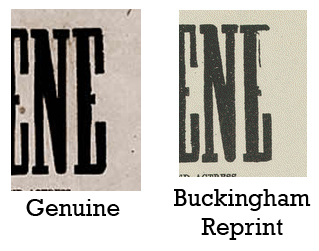 This should make it easier to see how Buckingham used the correct font that wasn’t available for other reprints. Also you can see how Buckingham fixed the typo “Sensation” to “Sensational” and how other reprints included this correction. Does anyone know where I could purchase a playbill that was produced by the doorman from that evening. I’ve literally been looking for months with no luck at all. TIA! I can help you with a few of your questions. First off, Richard Wallace Polkinhorn and Henry Polkinhorn were half brothers. Their father, Henry, Sr., had two wives with Richard being the son of the first marriage and Henry being the son of the second. Henry employed Richard Wallace’s son, Richard Oliver, in his printshop. After Henry retired, Richard Oliver partnered with Henry’s so and later became the sole owner of the Polkinhorn printing empire. So yes, Henry and Richard Wallace are very much related. Regarding the attendees of Ford’s that night, there were many people who later claimed to have been there but nearly impossible to verify them. So members of the Polkinhorn family may have been at Ford’s but it’s really hard to be sure. The reason there were two issues of the playbills is because the Ford’s wanted to include the advertisement for the song, “Honor to Our Soldiers”. It was originally meant to make its debut the bet night, April 15th, but was moved up to coincide with the Lincolns’ visit. It could be that they Fords requested copies of the music be printed by their printer, Henry Polkinhorn, but I have never read that before. I would recommend you contact the Abraham Lincoln Library or another “Lincoln” group for help with your Stackpole signature. He evidently had a long career t the White House, so I’d be surprised if you couldn’t come up with something. I hope this helps an thanks so much for commenting about your family. Very interesting, Dave. One of your best yet. Thanks, Wes. I aim to please. I liked it, Dave! Gotta keep this post just in case I ever get enough hid from the bride to get a real one! While I feel pretty capable of authenticating a playbill, I couldn’t even come close to placing a value on a real one. Heritage Auctions sold a pretty rough Buckingham reprint for $1,015 in May of 2009. I would imagine the cost of a true original would be extremely high. One can dream though. Depending on condition, they sell from $5000 to $15,000. A pair of originals (first and second states, like the pair at Harvard) sold for over $30,000 in 2003. Thank you so much for the expert opinion, Peter. I imagine genuine originals would be fairly rare, right? I have a program but not positive of whether it is a reprint or original. While the “495” does not have the extra space in it, the font of the Octoroom, from the spacing, appears to be the original font. Also the last E in Keene is perfect. In addition, I have an old classified ad from a newspaper…just a cut out…that says the following: A. Lincoln, Attorney and Counsel at Law, Springfield, ILL. To whom it may concern My old customers and others are aware…and perform other matters in a small way. Where would be best place to go to autenticate and also sell these items? I sent you an email. I’d be happy to give you my opinion on your playbill. Nancy, do you still have any of these items? And/or would be willing to sell? I am 2 yrs. late in seeing this “issue” of your blog, Dave, and like We said, it’s one of your best. I don’t know how I missed it! This is so important to a study of the playbills that I must print it out and insert it into my reproduction copy of Brenner’s study of the Ford'[s Theatre playbills. Kudos, Dave! See you in March! After an episode of Pawn Stars , in which a young man brought in an assassination playbill , only to be told by Rick that what he had was valueless , I realized that one must really bone up on articles such as these before handing over any money . Great playbill tutorial . I’m glad that this proved helpful to you, Jack. It is unlikely that there are many genuine Lincoln assassination playbills still out there in private hands, so be very cautious when someone is offering to sell one. Hi, Dave, In my research for my book about President Lincoln’s great coat, I have been looking for an original image of the “assassination playbill.” I was aware of those that announce Lincoln’s attendance as not the initial playbills but after reading your article here I understand further about the reproductions. Accordingly, is the playbill here https://www.loc.gov/item/scsm000300/ a reprint? Of particular interest are the notes: “Brown” type reproduction. Cf. Brenner, Ford’s Theatre Lincoln Assassination Playbills. It took a little bit of searching but I found it. 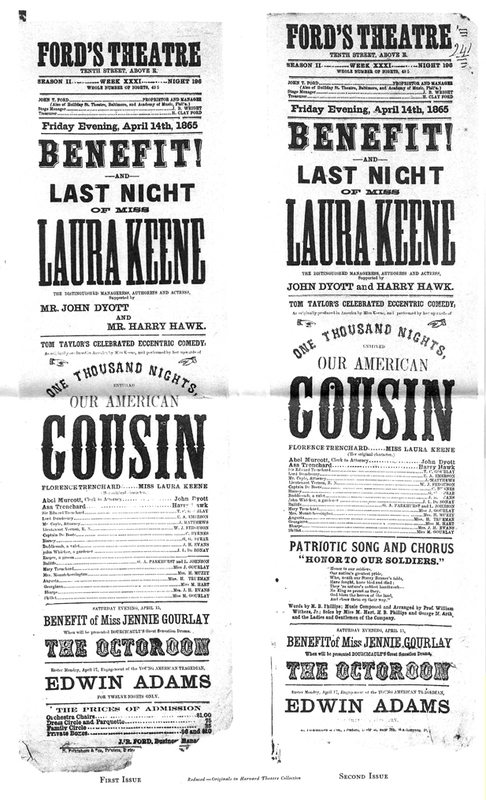 The text block of the Our American Cousin playbills took up 18 inches in length and 4.5 inches of width. The paper surrounding the text wasn’t uniform with some playbills were longer than others. The best bet would to put a half inch of paper around the text on all sides with one side getting a little more. Either that or off center the text a little bit on the paper. I hope this helps. Very helpful indeed . Thank you much .